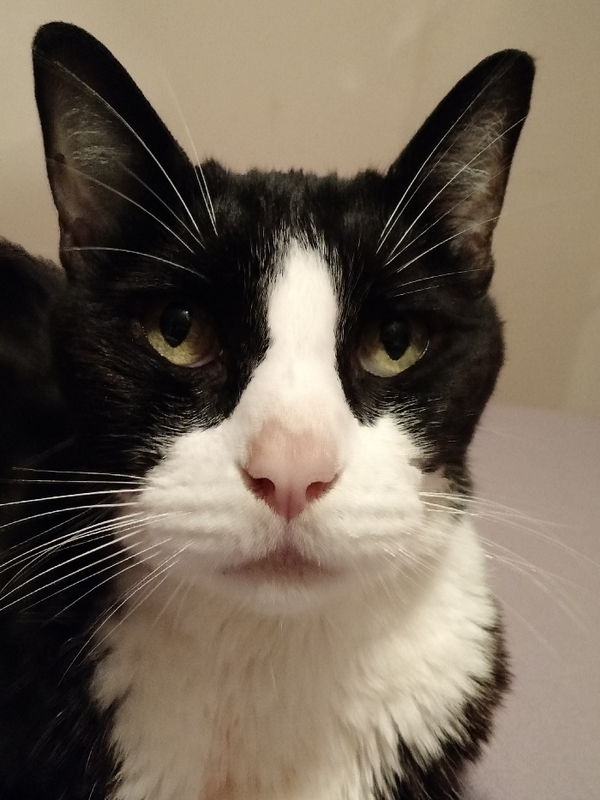 Danny was found in 2004 as a ten day old kitten under a trailer at a gravel pit. He was a member of a large feral colony. He was severely dehydrated and I wasn't sure he would make it. I bottle fed him and he soon became a vibrant, active, gorgeous black and white tux weighing nearly 14 pounds. Danny came to me during a very traumatic time in my life - I was trying to divorce my mentally ill husband who was attempting to kill me for life insurance proceeds. Danny saved me. He and I lived in a 20 foot travel trailer on a friend's rural property. He never tired of my stories and would try to cheer me by bringing me his favorite toy, a catnip filled fuzzy carrot, or sing me a lovely purr-song. He didn't even mind when I would cry on his beautiful, black satin fur. He went everywhere with me and always enjoyed traveling. About two years ago he began to lose weight. He was ravenously hungry. I took him to the vet. Blood work came back normal but my vet said she suspected hyperthyroid. Hill's diet did nothing but make him lose more weight as he soon refused to eat it. Multiple thyroid tests came back normal. His second vet diagnosed him with lymphoma and sent us home. Third vet said it was IBD as he had developed diarrhea. He was put on Prednisolone and given probiotics. He underwent an ultrasound and no abnormalities were found. Four vets and three clinics later, I am told it is chylothorax. He has undergone five chest taps due to difficulty breathing. My brave, beautiful Danny now weighs only 8 pounds. I did extensive research and believe the issues are all related. He has had normal blood values all along. The heart test came back negative. He has always been an indoor furkid. I found several references to rutin having a positive effect on the pleural effusion. I began giving it to him about 15 days ago and just upped it to 500mg twice a day. He is also now on Lasix but it seems to have little effect other than to dehydrate him so I administer sub-Q fluid as needed. I am running out of resources and ideas and the surgery to correct the pleural effusion is more than I can afford. His appetite is still very good but it seems he cannot absorb the nutrients. Has anyone else encountered chylothorax along with lymphoma?